A while ago, we discontinued our training tracking system because, among a few other factors, it was not a competency based training framework. This was a hard decision for us and we almost went back on it a couple of times. In fact, just when we decided to discontinue this feature, a lot of people suddenly became interested in using it. However, we stuck to our decision and rode the storm out. Here’s why. Training and employee development are probably the most important aspects to the success of a business. Without proper training, your employees will be unable to keep up with modern trends and tools, and this would eventually mean substandard performance for the whole company. Because employee training is this important, we analyzed our training tracking system and decided that, although it is similar to what is obtainable in other niche software, it doesn’t quite provide the power and features needed to support effective employee training. But we weren’t throwing in the towel, certainly not. After careful planning and consulting, we recently decided to go big on training with the design of an automated competency based training framework, built into our Learning Plan system. This system offers features you cannot find anywhere else. 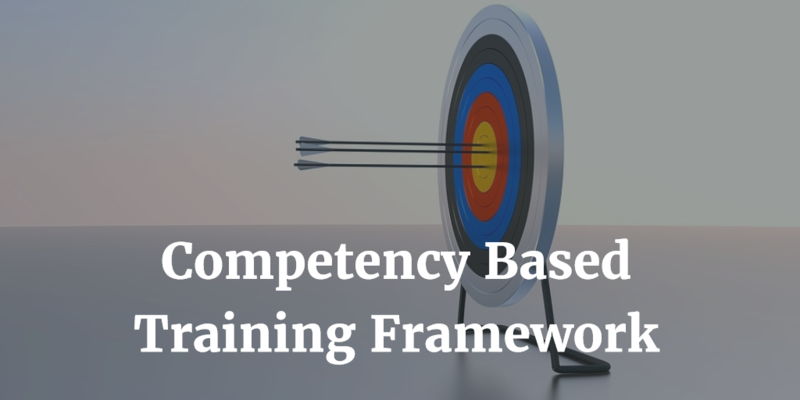 How Does Our Competency Based Training Framework Support Effective Training? For training to be effective, it has to be suitable to the needs of each employee. If you use a one size fits all approach to training your employees, you would end up with training that fits no one. It’s kind of like an electronics company producing one size of boxes for all their products. Whether it’s a fridge or a small speaker, it is packed in the same large size box, because creating different size of boxes takes extra effort. At the end the result would be ridiculous. In a sense, many training approaches follow this same pattern. 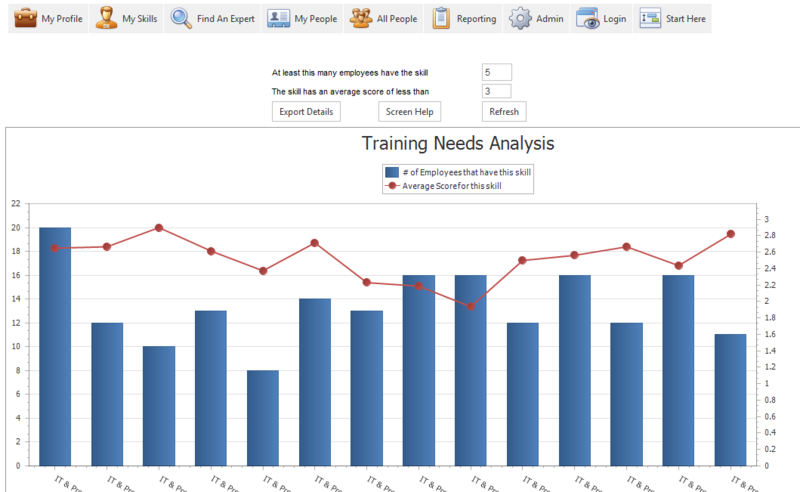 Of course for training, the effort required to make customized training plans for each employee can be incredible. For a large organization, it might even seem impossible, but that’s where our Competency Based Training Framework comes in. Our system is uniquely designed to help you make employee training suitable to the needs of each particular employee. Here’s how. Our Competency Based Training Framework pulls information from an employee’s skills profile, job role skills requirements, and certifications to determine the exact skills each particular employee is lacking, or needs to improve on to support the business objectives. When these skills are identified, the system then automatically recommends the corresponding training that would enable the employee acquire or improve on the identified skills. The system also recommends trainings that would help employees maintain their certifications. Using job role as an example, let’s assume an employee works as a Business Analyst, and by the definition of this role in the system, occupants should be experts in Data Analysis. If this person doesn’t have the required skill level, the system searches through available courses to find one that offers the Data Analysis skill and at expert skill level, and recommends it to the employee. Thus, the competency based training framework takes care of all employee training without an admin lifting a finger. Of course, the system also allows admins and managers to manually add trainings to employee profiles as seen fit. One important thing to note is that this system would be most effective when you have the right trainings planned in the company. Otherwise, training needs would be identified but there would be no training in the system to recommend. The good news for you is, you can use our Training Planning dashboard to ensure you plan the right training. This dashboards helps you identify the skills that are important to your business but lacking across the company – vital information to help you make the best training plans for your employees. When an employee decides to take a training from the automatically recommended plans (or is assigned a training by a manager), they get a set of tools (Individual Development Plan) to track their progress on each training. These tools help the employee visualize their current courses, the progress they have made, the time spent on each course, and other important aspects. Employees can also add unique learning plan activities in their IDP to track other training opportunities such as personal development, soft skills gained from working with a particular professional, etc. Getting your courses into the Competency Based Training Framework is very easy. 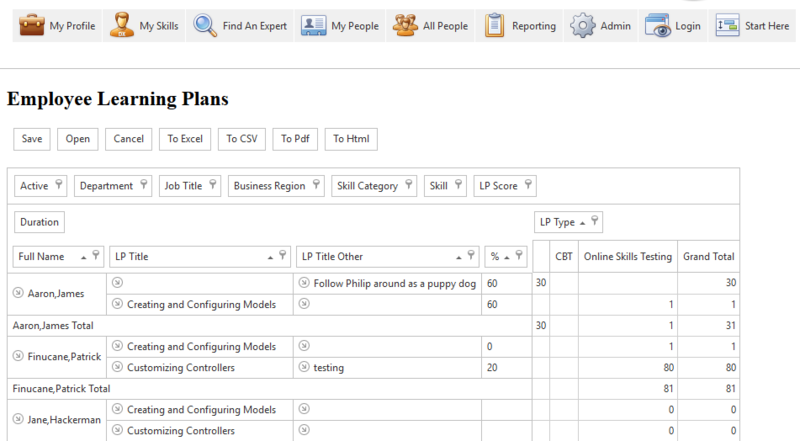 If you already have them in a Learning Management System, you can import them into our system and cut out extra work. You also have the option of creating individual trainings in the system. For each training, you can add skills that will be gained after the training is complete, as well as the skill level for each skill. 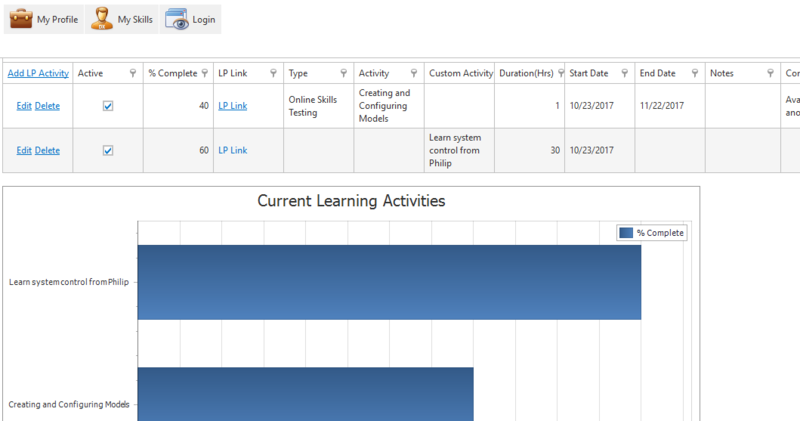 Admins and managers can view a report of training activities in the system. This report shows the courses in the system, who is taking what course, how far along they are, what skills they will gain at completion, and much more. You can drill down on this report to display particular courses, or only people in a department, job title, location, etc. With reports, you will be able to understand your current training plans, see how these can impact company projections, and plan for the future of each department and individual employee. Every company has a training budget. This is money set aside with the plan that training programs would make employees more effective in their role, and help bring in more money to the business. Thus, it is best to ensure your training plans are based on deep insights into the needs of your company, and of individual employees. Our Competency Based Training Framework, built into our Learning Planning System provides this insight and also automates the process. 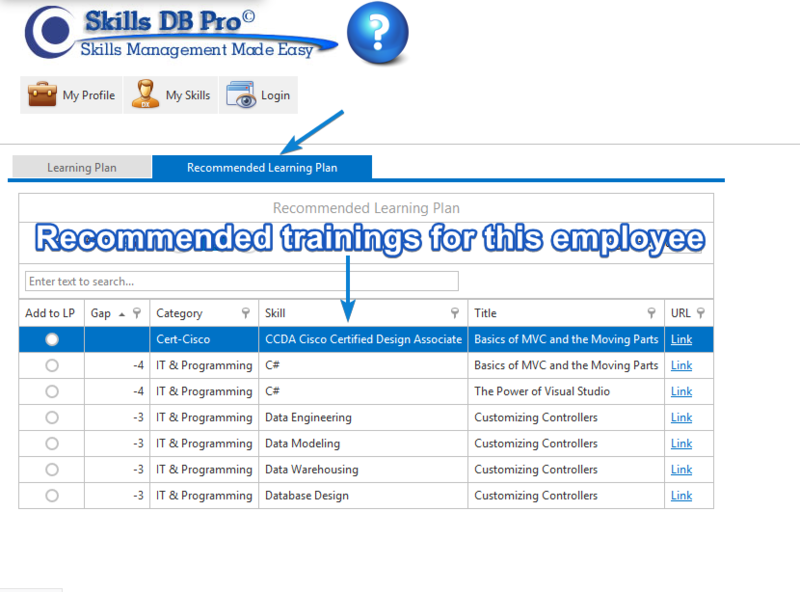 If you already use Skills DB Pro, please contact us if you need help setting up this feature. It is already active on all SaaS accounts. If you are new here, please sign up for a free 45-day trial of all our features.